More than 100 University of Dayton students, faculty and staff gathered in Chaminade Chapel Thursday evening to pray for Sean Ferguson, a 23-year-old senior marketing major from Pittsburgh who was struck by lightning Wednesday night, to come together as a community and to offer comfort to his family. for the full healing and recovery of Sean Ferguson. "Blessed Chaminade, his is one of your own! for Sean's full recovery and complete healing." 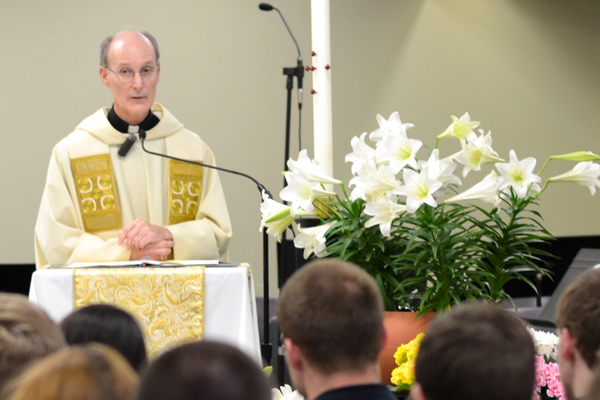 Sean's strong faith and Marianist commitment was a consistent theme throughout the service, evoked by Schimelpfening, the Marianist student community and Sean's family. His father, Mark, rose at the end of the service, to thank those gathered and the campus community for "sharing your faith and sharing your love for Sean. Echoing Sean's strong faith, he reminded the gathering that "it wasn't that God wasn't with Sean, it's that God and Jesus are with him. God bless you all." Sean was struck by lightning as he was walking in C Lot near the RecPlex about 7:15 p.m. Wednesday. Several people rushed to his aid and administered CPR until emergency responders arrived. He was taken to Miami Valley Hospital, where he was in critical but stable condition on Thursday, according to his father. "I am overwhelmed by the outpouring of compassion, love and support toward Sean and toward our family. That includes, but isn't limited to his brothers in the Marianist student community and the Lighthouse retreat team, who have held a prayer vigil around the clock to pray for and support him," he said. Mark Ferguson said the family extends thanks to the entire campus community for their prayers and support and to the team at Miami Valley Hospital for everything they are doing for Sean and his family. The far-flung University of Dayton community and many people with no connection to the University took to social media to send prayers, good wishes and thoughts to Sean and his family. More than 220 comments were posted to the University of Dayton Facebook page with more than 4,000 people taking some action to share, like or engage with Sean's story.